Plumbing is a large part of your kitchen, and if you’re updating your kitchen, you don’t want your plumbing to ruin its new value. A shiny new kitchen with faulty old plumbing isn’t going to serve, so you should always consider having the plumbing checked and updated if you wish to really transform your kitchen space into a more usable, more beautiful, and more valuable one. One common reason for Crofton MD kitchen remodeling is to take a small or inconvenient kitchen and turn it into something that has plenty of space for you to use. Kitchens with too little counter space, for instance, are kitchens that will be quite difficult to prepare full meals in, and adding a countertop remodel can really help to give you the room you need. Rather than juggling ingredients and knocking things over, everything will be able to be placed in its own organized and simple to utilize area. 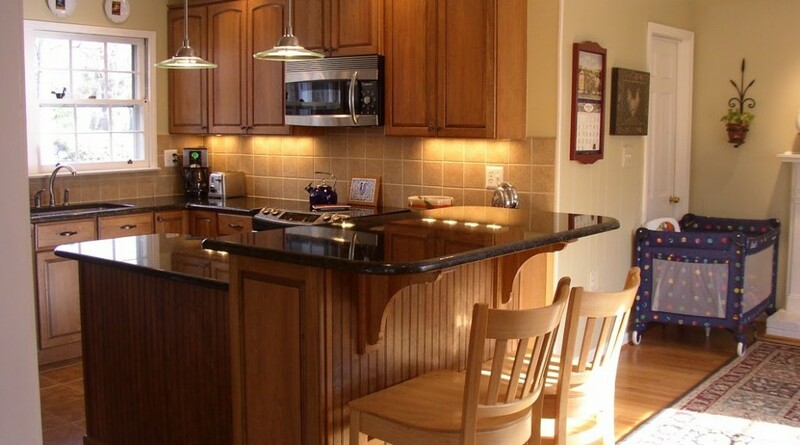 Cabinetry is another big concern in many kitchens, and one that often inspires Crofton, MD kitchen remodeling jobs. Cabinets are needed to store everything from your food, to your tableware, to your cooking utensils, and a kitchen with too little cabinetry is a kitchen that is going to get disorganized quickly. Putting things away will get tricky, and you’ll find yourself improvising new spaces for things to go. With a kitchen remodel maximizing your cabinet space, you can find a specific place for all of your things to go, and you’ll be able to keep things organized as you won’t be shoving things in any place that seems to fit. Kitchen remodeling can also be used to expand or open up a kitchen, and these large scale Crofton, MD kitchen remodeling jobs can really enhance the entire kitchen experience. For instance, if you have an island that seems to get in the way, a full kitchen remodel can get rid of this island, or shrink it, and provide you with more usable open space adding to your cooking and serving convenience. A kitchen remodel is one of the biggest suggestions to those looking to increase the value of their homes. Before a sale, you’ll want to bring your home’s value up, as well as create a space that prospective buyers will look at and want to call their own. An open, modern, and updated kitchen will be enticing to those interested in purchasing your home, and it could help you to have a quicker sale. In terms of monetary value, with a Crofton, MD kitchen remodeling job, you can expect to recoup over 80% of the cost of the remodel in higher value of your home, and since those looking to buy won’t walk into the kitchen and think that they’ll be required to invest in a remodel themselves, it can help your home to sell much faster. With these two points, it’s easy to see why kitchen remodeling is such a popular home improvement choice for those looking to sell their residence. For those who have just moved into a new Crofton area home, there will often be things that you’ll want to do to update the space and make it your own. Because the kitchen is such an important place in the home, it’s often a first place of focus, and Crofton, MD kitchen remodeling can ensure your new home has just the kitchen you can love for the long haul. If you want to personalize your new kitchen, our designers can work with you to ensure that you’re getting just the kitchen you’ve always dreamed of, and every detail will be able to be overseen for perfect results. Crofton, MD kitchen remodeling can be done to make your selling process easier and more valuable, it can be done to update your existing home into a more convenient and usable space, or it can be done to personalize a home you’ve just moved in to. With a kitchen remodel and plumbing update, you’ll be able to rest assured that one of your home’s most used areas is one that will work efficiently for you, as you maximize your home’s value and potential. Our Crofton, MD kitchen remodeling designers can also work with you to make suggestions, go over design plans, and find out what you really want out of your new kitchen, so you’re always able to turn your kitchen fantasy into your home’s new reality! Contact us for your Showroom Appointment today.